It is now the height of summer harvest, and we hope your kitchens and bellies are full of it, and ready for more! The gradual warming of last week then the couple hot days at the end of the week have really pushed things along. This week’s coolness might slow things down a little, but probably not much. Last week our work was completely dominated by tomatoes and watermelons, and the week before that it was onions that kept our hands moving. We pulled a few weeds, got some cover crops seeded, and didn’t touch a hammer or drill — mostly we picked and picked, and picked some more. Here we go! The onions are curing in the greenhouse so they’ll store well into winter. They loved this year, growing healthy and large — though we plant them close so we’ll get some smaller ones too, since they can be easier for you to deal with. It was 99% pleasure pulling them, loading them on the truck, and laying them out to dry. The 1% was the weed picture — we have never seen a crop so weed-free in June turn into such a forest by July. Such is the weed pressure this year — we get them all out, it rains some more and new ones keep on germinating. So we keep going back for more! The dry spell was great. We’ve been able to add water just where we want it, and keep it off the melons and tomatoes, so their flavor has been great and overall very consistent. There are lots of harvests left, and yields unknown, but the winter squash is the biggest remaining mystery for us. The vines are so tall and tangled you can hardly see the ground, or fruits, in those fields. There are some squashes starting to ripen though, and it looks pretty good, as far as we can tell now. It has been such a cool summer they may not have had enough heat to get really large; they had plenty of water no doubt. We are super curious to see what those vines are hiding! We’ll have to wait a few weeks though, and dig into the awesome harvest in front of us. We hope you’re enjoying it! Whew there’s lots of details to tell you about most crops, we’ll do our best to get them all in here. Tomatoes took off last week. Expect even more this week, and more different types. Feel free to ask about different types or varieties. 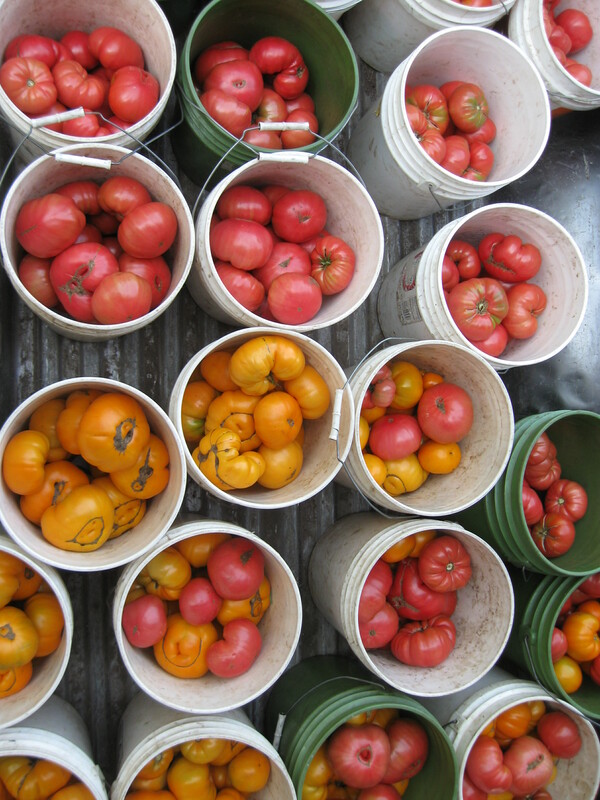 For extra tomato boxes, the next 2 weeks is the best time to be sure to get them. After that we hope to harvest into October, but supplies dwindle in September — sometimes early, sometimes later. This is TOMATO TIME, no doubt about it. We sometimes have extra boxes for sale at share pickups, but often we don’t, so place an order two days ahead to be sure we’ll have them for you. 12 lb box of nice seconds for $20. We are still taking orders for tomorrow (Monday the 17th) until 8 am. If you get a bad melon, please email or tell us in person and we’ll be happy to get you one to replace it as soon as we can. It really makes us better melon pickers. Please tell us the color, the day you picked it up, and what was wrong with it. Someone even suggested sending a picture, if you are so inclined. We might recognize it if it was on the suspicious melon list, but a picture is not required to claim your replacement! Onions — There will be a few sweet onions left this week and some uncured storage onions. All should be eaten within a week, or kept in the fridge. The storage onions will be ready for longer storage in 2-3 weeks, we’ll let you know here. We’ll miss the sweet onion flavor….but there will be some shallots later on. The shallots got bigger than ever, which means there should be a lil more for everyone. We don’t grow a lot of them because they yield much lower and so cost us more to grow, which is why they cost more in stores too. Eggplant is here. Globe and Asian types. The globes are the bigger rounder ones, good for parmesan, sandwiches, or other places where bigger pieces are wanted. In general, both types can be used if you’re dicing them up for a long-cooked dish like ratatouille. We use the Asian types since they don’t need to be peeled, and are a little sweeter. This makes them better for stir-frying too — they soak up tons of flavor from garlic and soy sauce, or other things they’re cooked with. 2 more weeks of peak, then they’ll slow down. Also, eat your eggplants soon after getting them — their preferred storage temperature is 50 degrees, which is not an easy temp to find at this time of year. On the counter, they wilt or get spongy in a day or two. In the fridge, they get soft and brown spots after 4-5 days, maybe sooner. If you wrap them in a plastic bag in the fridge they might keep longer. But mostly, eat them soon. Garlic will be a part of the share for 5 more weeks, for 6 total. After that it will be for sale for $1/head. You can buy more now at that price if you like, and we don’t need advance notice for garlic, unless you’re stocking up for winter. Which you can do, but let us store it for you until September or October. Peppers made less fruit than last year. It’s hard to say why — it may have been cool weather in July that prevented some pollination and fruit set…there might have been another variable, we’re not sure. Peppers are finicky when it comes to helping them turn those flowers into fruits. But they’re so darn good, such a great compliment to the other foods of late summer and early fall. They’re starting to turn red, so in a week or two there should be plenty of reds to go around, and a few orange ones. Broccoli is back, the next round of plantings is cranking them out really nicely. We’ll have a lot the next week or two, after that we should still have a good supply through the fall. Celery — We’ll start cutting stalks this week for you to take just a few, instead of full heads. We’ve heard from you that this works better, since a head is a lot to use in a week and can be hard to keep fresh. This way you can just grab a stalk or a handful, depending on your plans. But be warned if you don’t know — Minnesota celery is tougher, stringier and more flavorful than store celery. Most celery in stores is grown in milder climates in Michigan and California, where it stays more tender and less flavorful. Ours is best used for cooking; most people pass on “ants on a log.” We’ll have it until fr–t arrives. Cucumbers we’ll have 2-4 more weeks. We planted a later planting (#4) this year to try to drag it out a little, though they don’t like September. You Friday people must have craved the coolness of cukes last week, because you took almost twice what we normally go through! Fortunately we had some extras hanging around. Moving on: Our fennel is all used up now. If you would like more let us know we can consider doing a later planting next year for late summer/fall harvest. Baby leeks and scallions are all eaten up too. We’ll start in on the big leeks in September. A busy harvest is busy with details too! We hope you have a chance to cook and eat like it’s the height of summer, and share it with friends and family. Raspberries started ripening quickly in last week’s mini heat wave. They should be open for the next 2-4 weeks, maybe longer. THERE ARE BUGS IN THERE THOUGH. This is the same new-to-the-U.S. fruit fly that’s been wrecking berry harvests around the country, starting in 2008. (It’s technical name is Spotted Wing Drosophila, and it’s a species that can lay its eggs in fruit before it ripens. So by the time it’s harvestable, it’s got larvae.) They won’t do you any harm, the sight or thought of them just might make you want to buy some raspberries somewhere else. If you want to see them, open up a soft raspberry and stare –it looks like the seeds are moving, but they’re not seeds. Some people call it extra protein. Some people pass. Your choice. Freezing or cooking the berries makes them easier for some people to eat. We will do our best to set the picking limits so nothing is left to rot out there, which makes it even easier for them to reproduce. That’s a tricky balance though, since we don’t want to be out for the last people of each day. Sometimes in September there are fewer bugs too, like happened last year. We’ll see what happens. Cherry tomatoes, tomatillos and ground cherries are all starting to come in more and the limits should continue to rise. Beans, Flowers and the other Herbs are all looking good. All the beans we have are in those remaining rows — if you keep them picked, we’ll keep them watered, and they should produce into September. This week’s selection is : Tomatoes $20 for 12 lbs or $2 / lb, Watermelons 55 cents / lb, Lettuce Mix for $5 / lb, Asian Eggplant for $1.75 / lb, Carrots, Beets, Cucumbers, Zucchini, Summer Squash for $1 / lb, Kale and Swiss Chard for $3.50 / lb, Napa Cabbage for $1.25 / lb, Broccoli for $1.75 / lb. Place the broccoli into a large pot with about 1 inch of water in the bottom. Bring to a boil, and cook until bright green, or until tender but still crisp. Drain, and arrange broccoli on a serving platter.